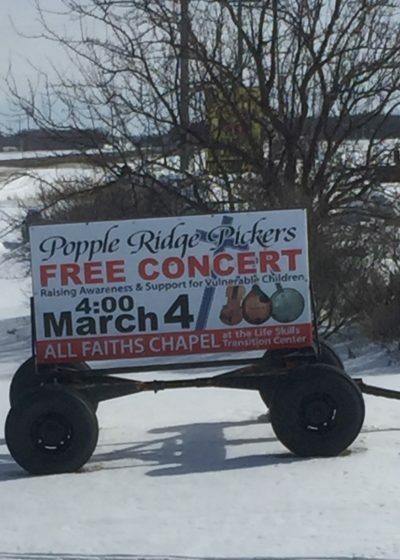 Popple Ridge Pickers Coming to Immanuel | "Northern Crossings"
Click on the above – the Popple Ridge Pickers are coming to Grand Forks next Sunday at 4 at Immanuel Lutheran Church 1710 Cherry Street. We had a concert with them last Winter/Spring. We were blizzarded out and had to re-schedule but had a great concert at the All Faith’s Chapel in the middle of a terrible thunderstorm. We hope you all can come to Grand Forks on the 21st at 4 pm. You will enjoy. This is one of the program advertisements we had up in various places. As you can see there was snow on the ground and here it is October and there is snow on the ground again. Hoping it is gone on the 21st.